Soya milk is liked by most people for its taste and nutritional values. Its numerous nutrients makes it a great beverage for school and work any day. Soya milk sold in stores can come with a high price tag, especially when compared to the prices of conventional cow milk. On the other hand, soybeans can be purchased at a lower rate, and can be obtained in its organic form. Making soya milk at home is quite easy, and this article is intended to help you learn how to make soya milk. If you would want to be making your soya milk daily, you need to get any of these machines, Soyalife, Miracle, Soyajoy, Soyawonder, Soyquick, Vegan Star, or other devices that can process the soya. Get the soya beans cleaned up and soak it for about 10-16 hours in water. You can also get rid of the hulls by kneading them and using water to flush the loosed hulls. This hulls removal makes the entire process of extraction more efficient. Another alternative is to crack them before soaking. Soya bean hulls come off easily and can be easily flushed away. You need less soaking time of about 6-8 hours when you make use of the cracked soya beans. The enzymes responsible for the development of beany flavor are destroyed by heating the soya beans. The best way to get them heated without destroying the flavor is by putting the soaked soya bean into a microwave for about 2 minutes. Pour the whole water used for soaking the soya bean into your blender, before pouring the whole soya beans into your blender. Add about four more cups of water and keep blending until a smooth paste is formed. Then get a cheesecloth and pour the blended mixture into the clothe and hold it over a large pot. Remove as much water as you can by squeezing. After squeezing for a while, pour back the soybean left in the cheesecloth back into your blender and add about 3 more cups of water and keep blending until you get a smooth paste. Repeat the straining process using the cheesecloth. Pour back the soybean pulp into your blender one more time and add 2 cups of water, bringing the entire added water to 11 cups. Then strain the mixture for the last time. Heat up the soya milk until it reaches the boiling point and continue heating for 5-10 minutes. Soya milk can be stored in the refrigerator for up to 3 days after cooling. No lactose. More than 75% of the entire world population are unable to tolerate lactose. However, it affects some more ethnic groups than others. For instance, 75% of Africans and 90% of Asians have cases of lactose intolerance. As an added benefit, some probiotic sugars, raffinose and stachyose can be found in soya milk. The prebiotic sugars are known to boost immunity and reduce toxins in the body. Reduce cholesterol levels. The high level of saturated fats found in the milk of cows is quite unhealthy and can increase your cholesterol levels. Soya protein can also reduce cholesterol levels. The US Food and Drugs Administration confirms the possibility of soya protein reducing the risks of coronary heart problems when incorporated into diets that are low in cholesterol and saturated fats. According to the FDA, 25g of soya protein should be added to meals daily. Promote weight loss. Soya milk is known to have a low sugar content when compared to regular milk. Cow milk is known to contain up to 12g of sugar in each cup as opposed to the 7g contained in soya milk. This explains why one cup of whole soya milk contains only about 80 calories, which equals skim milk. Additionally, the mono-unsaturated fatty acid contained in soya milk can slow down the absorption of fat by your intestine. This is another weight loss benefit of soya milk. Also, you get extra doses of fiber, which gives you a fuller feeling for a longer period. Strengthen the blood vessel integrity. The phyto-antioxidants, the omega-3 fatty acids and omega-6 fatty acids contained in soya milk can all protect the blood vessels from hemorrhage and lesions. These compounds stay attached to the lining of the blood vessel and help defend the lining cells from attacks by free radicals as well as cholesterol benefits. The attachment of these nutrients equally improves the flexibility and fluidity of the blood vessels to make them more resistant to changes in blood pressure. Flatulence. 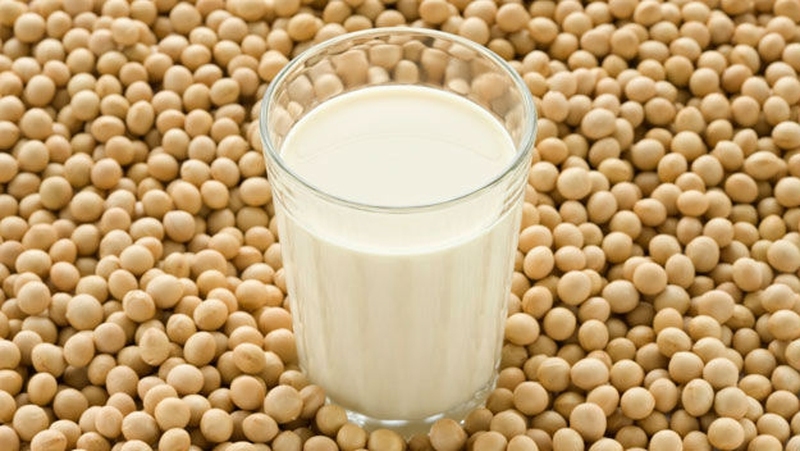 Soya products which contain high protein are at the forefront of gas productions. The quantity of gas produced will largely depend on the quantity consumed and quantity your body can tolerate. If you take moderate quantity of soya per day, it won't lead to any serious gas issues, though a number of pregnant women suffer excessive bloating and gas after taking these soya-products. In these cases, it is more advisable for such women to stop taking soya completely and other foods containing soya. The amount of soya one can take without developing gas complications varies from individual to individual. Soya allergy. Just like shellfish, peanuts, eggs, milk allergy, etc., allergies to soya are also known to be present. People who are allergic to soya protein can experience a number of symptoms after consuming these soy-products. Some allergic reactions that can be developed include: cough, hives, coughing, facial swelling, diarrhea, fainting, vomiting, etc. Some severe allergies that can lead to death are quite rare, though possible. This is the reason why people with soya allergies are admonished to be careful when it comes to consuming contaminated soya products.